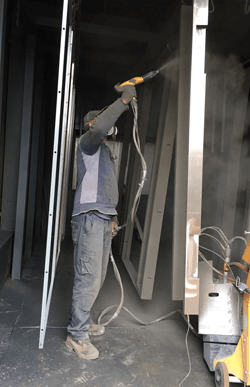 At Multi-Installations Ltd we have an in house powder coating plant. We can provide large sections according to the capacity of our oven, as the internal dimensions of our oven are 6m Long, 3.3m High and 3.4m Wide. The latest automation technology means we are highly competitive for volume orders and large batch quantities. 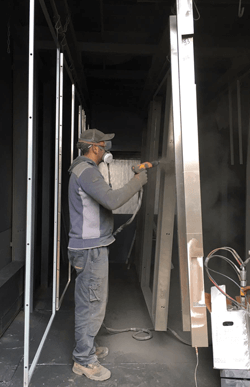 Powder coat is paint in powder form which is electrically charged as it is sprayed onto a surface to be coated and then baked in an oven, where the powder particles melt and fuse into a smooth coating. The result is a uniform, durable, high quality environmentally safe and attractive finish. A powder coated finish provides a low maintenance, long lasting, colorful covering for architectural metalwork, fencing, gates and any other steel fabrication. Powder coated surfaces are more resistant to chipping, scratching, fading, and wearing than other finishes, meaning it is extremely durable. The process is also environmentally friendly as virtually no pollutants are released into the air. The powder that we use meets the requirement for impact BS300: Part E7 >20kg cm (N) and Humidity BS3900: Part F2. The range shows excellent resistance to water, brine, hydrochloric acid; dilute sulphuric, acetic and phosphoric acids, dilute alkalis, peroxides and bleach, alcohols and urea. The range has been tested to the requirements of BS 476 parts 6 & 7 for fire and has a Class 0 surface as defined in various national building regulations. 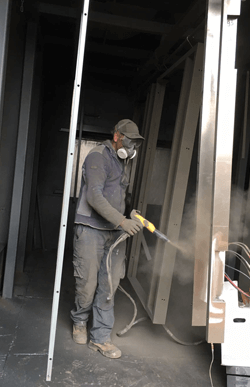 As specialists in steel architectural metalwork where high quality finishing is critical, Shot blasting is a method used to clean, strengthen (peen) or polish metal. 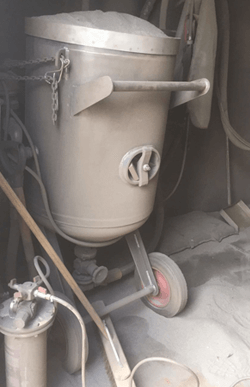 Shot blasting is useful for many industries because it provides a consistent and uniformly fine, rough or matt surface depending on the techniques and tools used and the type of surface required. 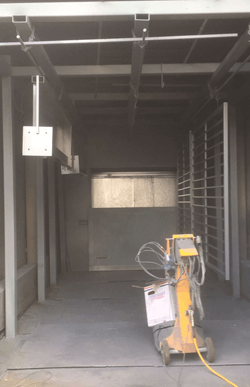 When it comes to finishing and cleaning operations, the shot blasting surface treatment technique is a highly effective option. 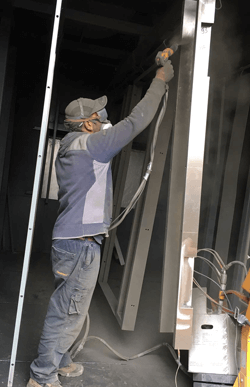 The shot blast technique uses high velocity steel abrasives in a controlled manner (at speeds ranging between 65 and 110 meters per second). This high speed controlled blast creates an abrasive impact which removes surface contaminates, thereby making it an effective method for cleaning iron, steel, forgings, machine parts, fixtures etc. Shot blasting provides higher production rates, wider abrasive selection and better blast pattern accuracy. The finished surface obtained is absolutely free from chemical deposits, scales and dust content. 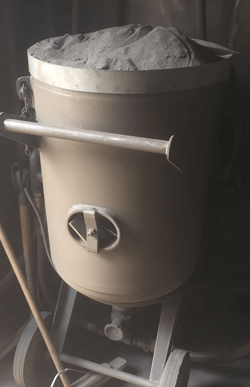 Shot blasting does not remove any virgin metal when removing scales. 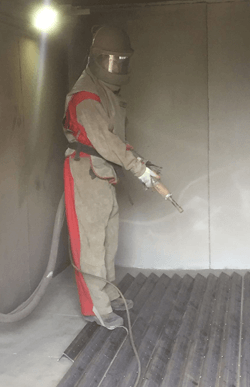 Shot blasting increases longevity and durability of protective surface coats as it adheres better to the shot blast cleaned and scale free surface. Shot blasting facilitates the formation of a permanent bond between the protective coat (zinc, paint or epoxy) and the shot blasted surface. It also helps to detect surface faults or defects. Once Shot blasted the surface is powder coated. Powder coating is tough. It looks great. And it lasts a long, long time. In addition to being durable, powder coating is an attractive choice due to environmental advantages. Processing times for powder are generally shorter than for liquid coatings. Coated articles pass directly to the oven giving substantial time and space savings. Reduced health risks for operators – e.g. fewer hazardous materials and powder is easily washed off. Please contact us on 0208 731 1212 for all powder coating enquiries.